Our class, Curatorial Practice: Past and Present, filed into the American Academy — a mansion buried deep in the affluent Berlin neighborhood of Wannsee — on a beautiful sunny day. 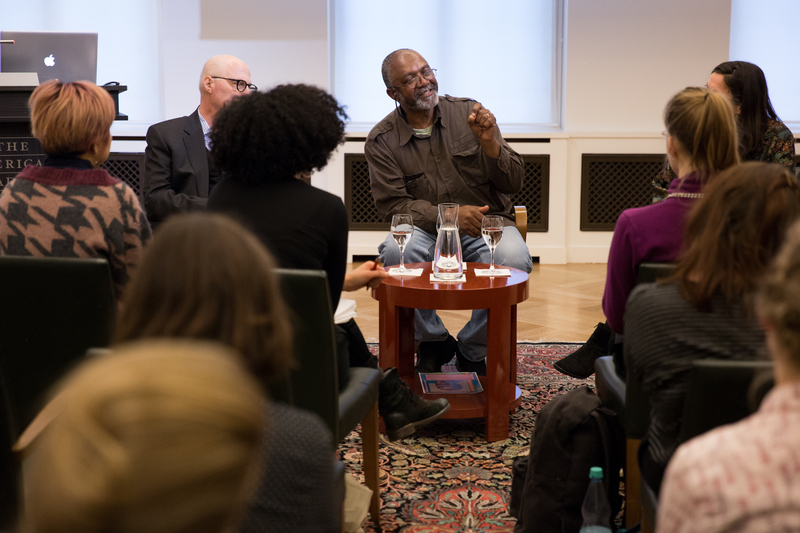 Any sense of intimidation we could have felt at the very formal invitation we received to the American Academy’s event, “The End Of Criticality”, a master class with Kerry James Marshall, quickly melted away once he began his talk. A sweet, friendly man whose warm laugh immediately puts one at ease, Marshall is one of the most important and influential painters today. Our curatorial practice class was joined by art students from the Universität der Künste and Freie Universität. 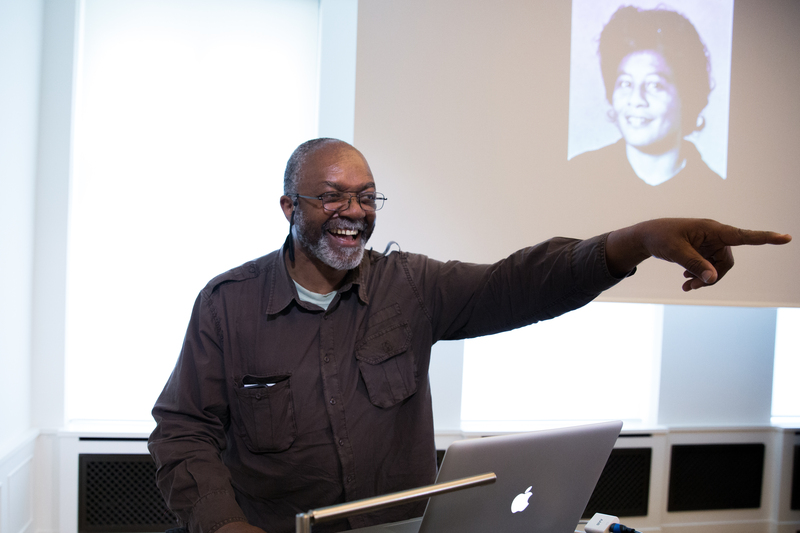 During his talk, Marshall spoke with us about everything ranging from ways of approaching art institutions built on a foundation of exclusion and exploitation to how his own love of the image began. Marshall started the talk with a 1950’s photograph of his Kindergarten teacher, Mary, projected behind him. In Marshall’s own words, this is the woman that he owes becoming an artist to. It all started with Mary’s scrapbook, which her kindergartners would be allowed to flip through during naptime as a reward for good behavior. Marshall described her as providing for his imagination, through her eclectic choice of images, an “indiscriminate array of possibilities” as well as setting him on a lifelong path as “a compulsive image collector.” He noted that an understanding of images as something positive and special was certainly ingrained in him through Mary’s pedagogical approach. The series is set in South Side, Chicago, in Marshall’s own neighborhood of Bronzeville. 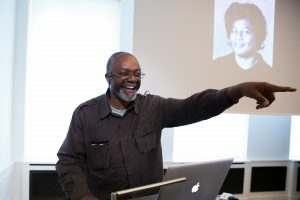 Marshall, in keeping with his assertion that Mary’s influence is still with him, showed us a collection of photographs he had taken around his neighborhood which documented the presence of Black nationalist and Black power aesthetics in everyday life. The collection showed that his installation Who’s Afraid of Red, Black and Green is part of a larger ongoing collection and documentation process. My question to Marshall concerned the presence of Yoruba, Vodun, and Candomble iconography in his work. He had, earlier in the class, stated his concern with the accessibility of his paintings, asking, “what if the viewer doesn’t know what I know while making it, does it still translate?” I was wondering about this problem in relation to the use of African and Afro-diasporic symbology within the overall Eurocentric environment of a museum or gallery. During a one-on-one conversation after the class, I mentioned to him that I had been raised in a family of Yoruba priests. His face lit up at hearing this; he pulled out his phone and started searching for a picture that he insisted I would “get”. In the photo a man dressed in a tailored red and black suit stands on the corner of a crossroads before a large green tree in South Side, Chicago. Marshall captured more than the coincidence of the red, black and green triad in the shot. The photograph brought together various symbols: the man on the corner, the crossroad, the red and black suit, and, finally, the green. The crossroads, corner, the red and black are all sacred to the Yoruba deity, Eleguá. The photograph’s aesthetic and symbolic spontaneity worked perfectly to create an Afrocentric composition. Marshall smiled, saying that the man’s choice of colors was no accident. These color combinations are common in the various “hoods” of America. He showed the photograph to two European students standing nearby. They didn’t “get” it. He was trying to prove a point. I had approached him with the question “Do you (or should) any artist working with Afro-Diasporic specific issues and aesthetics concern themselves with the fact that much of the audience and figures in the art world just don’t get it?” To the students who had not understood, he simply and clearly explained the various ways the scene recalled Eleguá of the Yoruba Pantheon. He turned back to me and continued, “You could just pass a pair of chicken legs on a corner and not understand.” We both laughed. We knew what that meant: an offering to Eleguá. To someone who understands, that sight would be one of piousness, one of prayer. The neighborhood I come from is filled with these “codes”, which I pick up on while knowing many around me do not. I mentioned to Marshall a fact I often reflect upon: “Our ancestors had to hide their religion, pretend they were practicing Catholicism under threat of death. That’s how they kept it alive in America. It’s the secrecy that has protected us all this time.” People of Afro-Diasporic faiths such as Yoruba, Vodun and Lucumi tend to be extremely secretive. Talking about many of the things done (much to White America’s horror) in ceremonies is forbidden. Nonetheless, our aesthetic (every faith has one) is so omnipresent in Black and Caribbean culture that many people adopt it without knowing where what they are adopting is coming from. Marshall argued that Black artists must “retrieve and reclaim” Black culture in order to keep it, as he put it, generative, sustainable and defensible. Marshall’s approach of showing me the photograph he knew I would understand the implicit meaning of as well as to people he rightly assumed would not understand brings across how, at the core of his answer to my question, is a concern with educating. The comic series “Rythm Mastr” addresses this concern in many ways. Comics are not considered high art. This frees the medium of the elitist barriers associated with painting. Marshall’s work with comics along with his interest in puppetry and plans to create an animation film reflect his commitment to making his work accessible to the younger generation of his community. The concern with education is subtle yet implicit through all of Marshall’s work in the form of his historical orientation. When I questioned him on the role of the Yoruba religion within a Black aesthetic, Marshall explained that the first step in building a Black aesthetic demands that Black people find their source, their roots. He stressed that the Black Power Movement was an economic, political and aesthetic movement. The political consciousness becomes imbued with colors, symbologies, rituals, linguistic heritage and innovations, which then synthesize and hybridize into the Black aesthetic. Having as strong a knowledge of the Western canon of art history as of Black American history, Marshall traced the trajectory of Western beauty standards. Painting, he argued, has served as a marker and creator of beauty ideals since its conception. For hundreds of years state institutions and powerful patrons have standardized these ideals. Black and brown bodies are not part of this standard. “Curatorial practice and art history are built on a structure that I have internalized,” Marshall admitted, though he has been a champion in the battle against this internalization. He is famed for the color of his figures’ skin: A blackness which he defiantly elevates to a status of beauty and grace that is known for both shocking and moving people. His use of black is exceptional. As one student in the class mentioned, there is an amazing amount of depth to the black in his work. His blacks are not opaque but richly hued — the result of a painstaking technical process of mixing and blending which Marshall broke down step by step for the class. He told us of his love for the color black. He asked us to take note of the symbolism of the ultraviolet light, or blacklight. As it is at the invisible end of the spectrum, blacklight inspires a consideration of visibility and invisibility within the exploration of a transgression of traditional beauty ideals. Addressing the issue of how to be a critical voice within the institutions one is problematizing, he went on to say that the museum as a cultural institution represents to Black artists a “structure we value which we have been left out of.” He advised us that we “have to negotiate with that structure. Get what you want or what you need from within that larger structure.” The “structure” in question here is that of the art world’s institutions and the problematics of systematic and social injustices perpetuated through these institutions. The “foundation on which the structure is built is never questioned,” Marshall stated. He believes that the problems of that foundation, one that is bloated with the looted cultural and religious belongings of former colonial subjects, is best addressed from within. His advice to young curators? “Always stay real. Tell the truth.” Keep a critical dialogue going and resist the pressure to agree with whoever you need to agree with in order to get ahead in the field. He got very real with us then and said, straight up, “curators don’t get a lot of money. It’s a thankless job.” Everyone laughed, some more nervous-sounding than the rest. He noted that a common question an artist in today’s art market must consider in regards to both their audience and the curators they work with is, “are the people looking at your work going to be as intellectually engaged as you are in making it?” Should an artist expect a curator to be as intellectually engaged with their work as they are? I think that any curator who does not have as deep of an engagement as their objective or who does not dare to question when necessary (or perhaps whenever possible), is not in it for the right reasons. And, as Marshall already noted, it can’t be for the money. Tani, Ellen. “How Kerry James Marshall Became A Superhero For Chicago’S Housing Projects”. Artsy. N.p., 2017. Web. 1 May 2017.